Need a quick dinner idea? Have little time but want lots of flavor? Do you have a pound of shrimp or chicken and a green vegetable handy? Let’s do this. Heat the coconut oil in a deep saucepan over medium high heat. When the oil is hot, add the shrimp or chicken and cook, stirring, until no longer pink (3 minutes for shrimp, 5 minutes for chicken). Remove the cooked shrimp or chicken to a plate and add the coconut milk, chili paste, salt, and red curry paste to the pan; bring to a boil and lower heat to simmer, allowing the sauce to reduce to about half. Add your green veggie and cook 1 minute more. Stir in the rice, shrimp or chicken, and lime juice, stirring to combine, and cook two minutes more (or until rice is hot). Top with sliced scallion and serve! Easy snow-peasy! 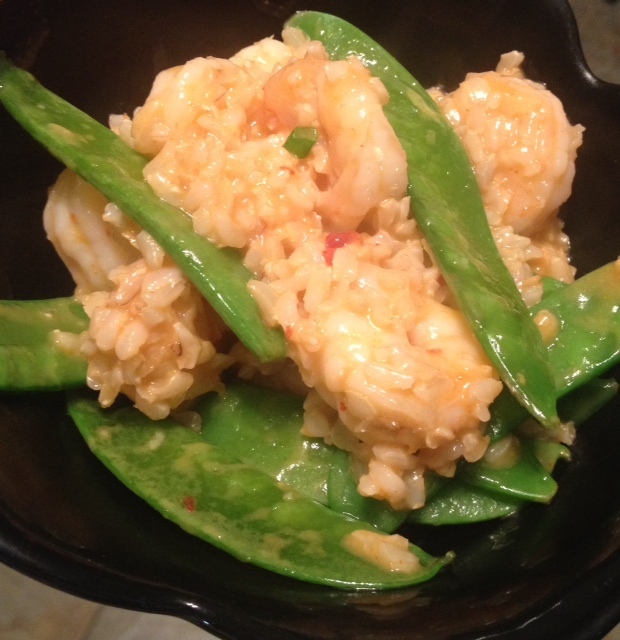 This entry was posted in Chicken, Classics, Dinner, Easy, Fast, Fish & Shellfish, Gluten free, Healthy Spin, One Pot, Quickie, Uncategorized and tagged brown rice risotto, coconut chili shrimp, coconut shrimp, fast coconut shrimp dinner, fast dinner, healthy risotto. Bookmark the permalink.